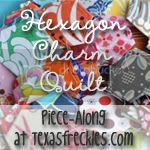 Are you working on a hexagon quilt? Share your blog address below and your fellow hexagon addicts can stop by to check out your progress! Only the information you enter into the name field will display on the list, so use your blog name if you don't want to use your real name. I can't wait to see all the fabulous hexagon creations in the works! Does it have to be a charm quilt? I'm with corinnea. I wonder about my sanity and if I will actually finish. But I am enjoying working on it. I've got a blog, but no pictures so I won't link it. I have less than 50 hexagons made anyhow (I'm a late starter), and a whopping 3 sewn together! I'll get there. i've been away so have made slow progress, though do have quite a few more scraps of fabric to cut up! i dont have a blog but have linked to my flickr, but if that's not what you want, feel free to remove it! I want to make one, but like Kait I'm not making a charm quilt. But this is my first ever attempted at making a quilt.